“Programs, services and activities for children with disabilities (CWDs), their parents and service providers must go on even during election preparations and campaign season”, remarked Mr. Helario Supaz, the head of the Persons with Disability Affairs Office (PDAO) under the Chief Executive’s Office of Taguig City when he called ASP Executive Director Ranil Sorongon. True enough, last May 9, three days before the election, ASP conducted a seminar entitled “Understanding and Managing Autism” in the morning and a simple family support group (FSG) session at the covered gym of Barangay North Signal Village, Taguig City. 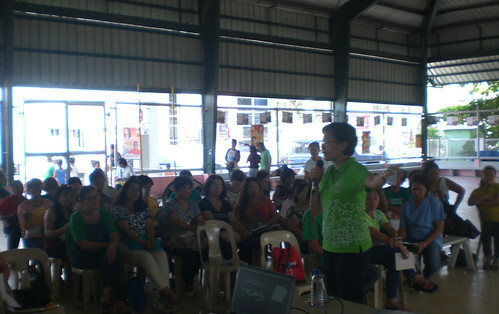 The seminar, conducted by Teacher My Sorongon, was participated by more than 120 barangay health workers and day care teachers. Participants were very attentive and participative as manifested by their constant asking of several questions including the controversial stem cell therapy and about media personalities whose children, they suspect , seemed to manifest some autism characteristics. The afternoon’s FSG, facilitated by Director Sorongon, Teacher My and Mr. Supaz, was composed of parents of CWDs, two persons with disabilities and teachers of students with disabilities. Attendees shared their issues and concerns ranging from the diagnosis of CWDs, schooling, therapy services, government support, and their need to attend seminars and trainings on autism. A list of issues and concerns, which were written by Teacher My during the FSG, would be tacked in the follow up meeting between ASP National Office and the PDAO of Taguig in order to address these and come up with concrete actions. Some of these issues were difficulty of getting a formal assessment from a qualified professional such as a developmental pediatrician due to financial constraint, inaccessibility and unfamiliarity with steps of seeking diagnosis up to getting interventions, difficulty getting and/or sustaining interventions such as SpEd, occupational therapy, speech therapy, difficulty availing of and/or facilitating the issuance of PWD ID card through PDAO, and clamoring for the organization of a parent organization that could represent all the CWDs and their families. Posters depicting the signs and symptoms of autism were also distributed to the different health centers and day care centers in Taguig which would serve as guidelines in detecting possible cases of children with autism in the community. ASP would like to thank the PDAO and Mayor Lani Cayetano for giving ASP the opportunity to touch the lives of the people of Taguig City.